If I think back on my life, I’ve eaten plenty of scrambled eggs. The awful realisation is that probably a scant majority of times, it’s been when I’ve been staying in some hotel - it can be anywhere in the world, the experience is much the same. You know what that means - a solid lifeless lump of egg that barely aspires to the purely utilitarian level of providing protein. How big a part food plays in your life is probably best defined by what default level you live at when you’re not deliberately out looking for “something special”. I was a child of the 1970s and was brought up on bland heavily processed foodstuffs, so for much of my life I’ve been perfectly happy with a default set at a pretty low level of expectations. It’s such a waste, because an egg is an egg. You might just as well have scrambled eggs cooked with care and with love rather than indifferently lumped out into portions. And the experience - and consequently your default expectations - is transformed. Mind you, love isn’t enough on its own. 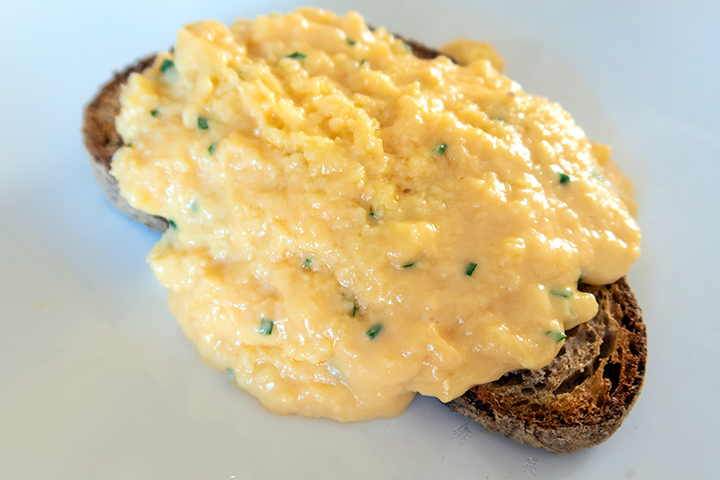 I have at least one friend who cooks scrambled eggs with all the passion you could ever hope for, but manages every time to produce unedifyingly grey results - but that’s the sort of thing that just a little technique will fix. It would help, of course, if the experts agreed on what the techniques are. I’ve always understood that grey eggs come as a result of seasoning the eggs at the beginning, rather than waiting until the end. Gordon Ramsay agrees with this. But then just yesterday I was watching a video with US super chef Thomas Keller producing perfect scrambled eggs having seasoned them at the beginning. The key thing is that something like scrambled eggs is a staple. It’s one of those things you will probably do often - so it’s worth investing time in experimenting to get it the way you want it. If you do the staples well, then you become used to a better quality of default food in your life. That’s my theory, anyway. So this is my version. It works brilliantly for me. If it doesn’t for you, then maybe try it a different way until you find a way that does. The most important element really seems to be to cook the eggs slowly and carefully, stirring often. I like to add a little more butter than you might think you should - but there’s no need to go over-the-top, and a little cream added at the end. I used double cream here, really because you don’t use very much, and double cream has a high enough fat content to be more effectively frozen if you want to avoid waste. But if you have other cream to hand, single or whipping, then use that instead. I made this just yesterday, using some fantastic double yolk eggs from Yare Valley farm. I’m not sure the double yolks made a noticeable difference to the end product, but it was fun to cook with them regardless. There is no precision here in the quantity of butter and cream you use - use more or less according to taste. Just don't underestimate the added flavour to be won through using just a bit more butter than you would normally think to use. Break the eggs into a bowl and whisk them together briefly until the yolks and white are fully mixed together - just 30 seconds should do it. Put about 20g of the butter in a frying pan and melt it over a gentle heat. 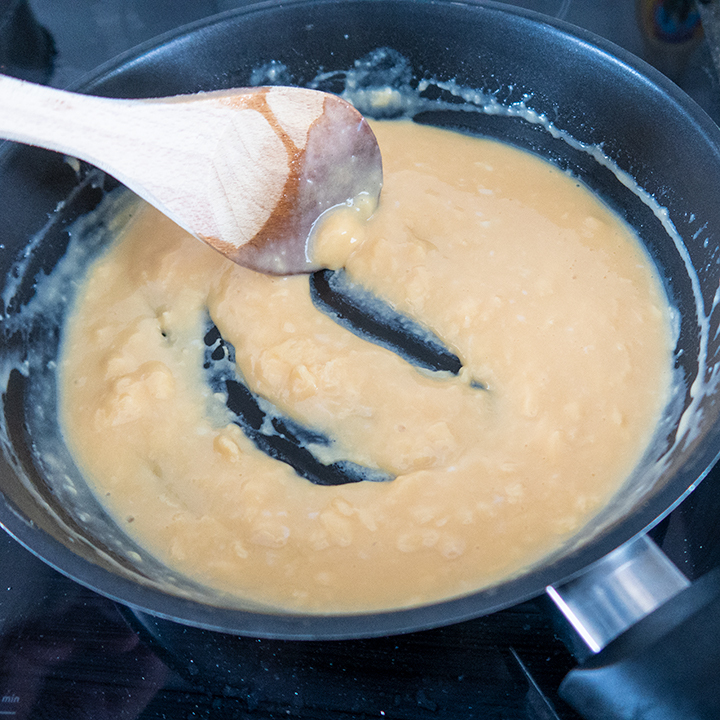 Once the butter has melted, add the eggs and stir continuously, keeping the heat very gentle. Don’t be in too much of a hurry. Slow cooking is the key. Keep stirring, particularly making sure you scrape up any bits of egg that start to stick to the bottom of the pan, so you’re mixing in any solids as the egg starts to cook. How firm you want your eggs to be is purely a matter of personal taste - take the eggs to the point where they’re close to what you want, then add the remaining butter and continue to stir while the butter is melting in. Finally, stir in the cream and add salt and pepper to taste. Continue stirring until the eggs are about as set as you want them. Stir in the chopped chives or parsley, if using, and serve. You will have some cream left over. If you use double cream, you can freeze the remainder if you don’t have plans to use it within the next day or two. It can then be used to add to sauces and soups. It’s trickier to do this if you’re using a lower fat content cream, like single cream. My understanding is that you can whip the cream and then freeze it - to date, I haven’t tried that, so can’t give that as a recommendation just yet. The best thing with the herbs is to grow plants - then you can snip off what you need without waste. But assuming you’re not in that situation, you can freeze any herbs you’re not expecting to use imminently - chop them up and mix with water in ice cube trays. You can then add these to meals as you cook.